Mammography is an effective screening modality for the early detection of breast cancer. The reduction in breast cancer mortality is greater for women aged over 50 at screening than for women aged under 50. Mammography can also contribute to an understanding of the biology of breast cancer. Screening trials provide good evidence for the dedifferentiation of a cancer as it develops over time, and the age dependency of this dedifferentiation explains much of the age difference in the effectiveness of screening. Mammographic density is an important predictor of future breast cancer risk, and has potential as an early endpoint in breast cancer prevention trials. Mammographic density is also an important determinant of mammographic screening sensitivity. The main interest in mammography has focused on its value as a method of screening. However, the population-screening trials conducted over the past 35 years have generated extensive longitudinal data on the relation of mammographic features both to tumour behaviour and the future risk of breast cancer in the normal population. In this review we briefly examine the effectiveness of mammographic screening, then discuss more generally the contribution that mammography can make to understanding the natural history and epidemiology of breast cancer. Mammography as a method of screening for the early detection of breast cancer has undergone many randomised trials. The results of seven of the eight trials that have been published display a considerable consistency. For women over 50 years of age at entry to a trial, the reduction in breast cancer mortality in those invited to screening is approx. 25%, and in women who are screened the reduction is approx.33% . For women under the age of 50 (the lower age limit varies across the trials between 35 and 40 years), the reduction in breast cancer mortality is considerably less, approx. 15% in all women invited to screening . The one discrepant trial is the Canadian National Breast Screening. Two aspects of this trial give cause for concern. Firstly, an independent review of the quality of the mammography concluded that, at least in the early stages, the quality was unacceptably poor . No one has ever suggested that poor mammography is effective. Secondly, there was a substantial and unexplained excess of advanced cancers at randomisation among women randomised to mammography, giving rise to concern that the randomisation process might have been poorly controlled [4,5]. In view of the importance of breast screening to public health, and the soundness of the evidence demonstrating benefit, it was unfortunate that The Lancet chose to publish an incompetent attempt at an overview . The shortcomings of that paper are well described in an editorial  and subsequent correspondence in The Lancet. However, three points are worth noting. The first is that the authors' criticism of the randomisation process in most of the Swedish trials is statistically incorrect because their analysis ignores the cluster randomisation. The second is that the difference in mean age between the trial arms in some of the Swedish trials, which the authors used to discredit the trials, are of negligible magnitude compared with the observed effect on breast cancer mortality and are in any case incorporated into the published analyses. The third is the authors' failure to acknowledge the serious inadequacies of the Canadian Trial. The Gotsche-Olsen paper is an example of uncritical application of arbitrary criteria, a travesty of what overviews should be attempting to accomplish. It is unfortunate that the name of the Cochrane Centre is associated with it, because the value of the Cochrane Centre depends heavily on the reliability of its output. Screening trials, in which one arm is regularly screened and the other is left unscreened, provide perhaps the only situation in which cancers arising in two identical populations differ only in the time of diagnosis. This permits the examination of how breast cancers change as they evolve with time. For this purpose one has to construct sets of cancers that are comparable; this is achieved by considering incident cancers in the two arms of the trial, ie removing length bias by ignoring cancers detected at the initial screening test for prevalence. As one would expect, incident breast cancers in the screening arm are smaller, and a smaller proportion are node-positive. They also contain a higher proportion of cancers classified histologically as malignancy grade 1 and a lower proportion classified as malignancy grade 3 . These changes in size, nodal status and malignancy grade seem in fact to be sufficient to predict the effect of screening in breast cancer mortality ; they can therefore be used both as early indicators of the effectiveness of a screening programme and as surrogate endpoints of trials examining secondary aspects of screening, such as changes in screening frequency . Such an approach is being taken to evaluate the effect on future breast cancer mortality of the UK national screening programme, using the data from the East Anglia region. This approach has the advantage that it is independent of changes in treatment or in underlying cancer incidence, both of which make the interpretation of changes in observed breast cancer mortality problematic. This approach has also been adopted in the UK trial of the effect of changing the interscreening interval from 3 years to 1 year. The use of predicted breast cancer mortality, on the basis of the three prognostic factors, leads to trials that are substantially smaller and shorter, for the same power, than trials based on observed mortality. The change in malignancy grade associated with diagnosis earlier in time, and at a smaller size, is clear evidence that some cancers evolve as they grow. Given the heterogeneity of the cell population comprising a cancer, it is not surprising that more malignant subclones evolve more rapidly. With the use of screening trial data to model this process of dedifferentiation and growth, it seems that the process is age-dependent, with a transition to high-grade malignancy occurring earlier in women under the age of 50. Mammography is also less sensitive at detecting small cancers in younger women, owing to the greater mammographic density of breast tissues (described in the next section). The effects of age on both sensitivity and the process of dedifferentiation provide an elegant explanation of the effect of age on the reduction in breast cancer mortality attributable to screening . Figures 1 and 2 show breast cancer mortality in the Swedish two-county study by study arm, age and malignancy grade. For women under the age of 50, mortality due to grade 3 cancers is unaffected by screening, in contrast with women over age 50 for whom the effect is substantial and early, relative to the effect for lower-grade cancers. For grade 2 cancers, the effect of screening on mortality is not appreciably affected by age (Figures 3 and 4). A clear picture emerges: cancers with a high malignancy grade have a poorer prognosis and lead to earlier death than lower-grade cancers; in younger women, transition to high-grade malignancy occurs more often at a smaller tumour size, and these smaller cancers are less readily detected at screening. The consequence is that mammography in women under 50 makes little impact on mortality due to high-grade cancers. The overall effect, compared with that in women over 50, is both smaller in magnitude and delayed in time. Cumulative mortality from grade 3 ductal carcinoma, women 50-74, invited to screening and control groups. RR, relative risk. Cumulative mortality from grade 3 ductal carcinoma, women 40-49, invited to screening and control groups. RR, relative risk. Cumulative mortality from grade 2 ductal carcinoma, women 50-74, invited to screening and control groups. 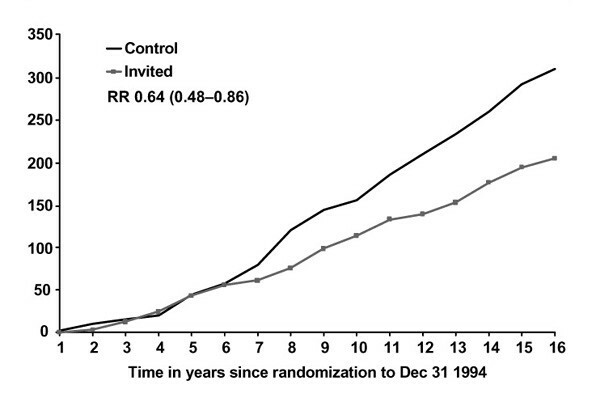 RR, relative risk. Cumulative mortality from grade 2 ductal carcinoma, women 40-49, invited to screening and control groups. RR, relative risk. The survival of women with small invasive breast cancers (less than 15 mm in diameter), often detected by mammography, is usually good. In a series of 343 such cancers in Sweden, survival after a median follow-up time of 6 years was 93%. Mammograms at diagnosis were classified into one of four categories: stellate (spiculated) mass with no calcifications, circular or oval lesions with no calcifications, spiculated or circular with non-casting-type calcifications, and casting-type calcifications. Of the 24 deaths in the 343 women, 8 occurred in the 24 women with casting-type calcifications at diagnosis. None of the 24 deaths occurred in women who had node-positive cancers. The relative hazard of mortality in those with casting-type calcifications compared with the rest of the group was approximately sixfold . For those with small cancers, it seems that the traditional prognostic factors of nodal status and malignancy grade are of little value in differentiating risk. The mammographic appearance is a better reflection of the biological characteristic of the cancer. This identification of a high-risk group of small cancers should be of considerable therapeutic importance. Since the early work of Wolfe  it has been known that the mammographic density of breast tissue is related to the risk of developing breast cancer. Fatty breast tissue is relatively translucent, in contrast with epithelial or stromal tissue. Classification estimates the proportion of the total breast area that is occupied by mammographically dense tissue. A four-point scale was originally used, although some researchers have used the numerical proportion . On a four-point scale, studies have reported relative risks of between 2 and 6 for the risk of the most dense category compared with the least dense, with a smooth gradient across the categories. With values between 2 and 6, mammographic density is a stronger risk factor, apart from age and BRCA1 and BRCA2 mutations, than almost any other risk factor studied . Groups of women at all ages include individuals with fatty, moderate density and dense patterns, but the proportion of women with dense breasts decreases with age, from over 70% for premenopausal women aged 40-49 to approx. 25% for women aged 65-69 . If we take a definition of dense breasts based on the proportion of the breast area occupied by dense tissue, as described above, the proportion of women with dense breasts decreases with increasing obesity because there is more fat tissue. For the risk factors age and obesity, the association with breast density goes contrary to the gradient of risk for breast cancer. To compensate properly for the obesity effect it is possible that a definition of breast density as an expression of the total volume of dense breast tissue, rather than the current definition based on area, might be more appropriate. For other risk factors, the association with breast density follows the gradient of risk, seen most notably for parity. Nulliparous and low parity women have a substantially greater probability of having dense breasts than parous women (odds ratio of approximately 4) . Similar trends are found for age at menopause and use of hormone replacement therapy. The effect of tamoxifen on breast density is consistent with the decrease in breast cancer risk after the use of tamoxifen. After 12 months or more of tamoxifen use, the decrease in the proportion of women with dense breasts is quantitatively consistent with the reported reduction in breast cancer risk . Breast density therefore has potential as an early endpoint, quantitatively predictive of future breast cancer risk, for trials of hormonal interventions. Breast density also has a major impact on breast screening. Dense tissue obscures the radiological picture and makes the identification of cancers more difficult. The result is a lower sensitivity and a higher rate of interval cancers in relation to the screening detection rate and the underlying incidence. Early results from the Swedish two-county study reporting higher interval cancer rates in women under 50, in comparison with older women, and a smaller proportion of stage 1 cancers detected in those screened, reflect this lower sensitivity . More recent analyses of the UK national screening data from East Anglia have demonstrated a particularly high proportion of dense breasts among the interval cancers . An additional finding was that dense breast tissue was associated with cancers of malignancy grade 3. Thus, interval cancers were found to be associated with both high-density and grade 3 tumours. This might suggest that the cancers missed owing to the breast density were of high grade on account of their size. However, the association of high density with grade 3 tumours seemed to remain after controlling for tumour size and mode of detection. If confirmed in another series it would be an additional indication that the mammographic pattern both of the breast tissue and of breast cancers is a reflection of underlying biological processes. The association of density both with higher cancer incidence (particularly of grade 3 cancers) and with lower screening sensitivity has implications for the organisation of screening programmes. Improving sensitivity in high-density tissue should be a prime focus of the programme's continuing quality assurance activity. In this regard, one can note that the benefit of tamoxifen, or compounds with similar benefits but fewer harmful side effects, not only would be to reduce breast cancer incidence, but would also improve the sensitivity of mammography in detecting the cancers that do appear. The benefits of mammographic screening for women over 50 are well established. Effectiveness under this age is more marginal. Breast screening programmes and the radiological images generated by mammography provide their own contribution to the understanding of tumour biology. The mammographic features of tumours and of normal breast tissue are probably an underused resource in breast cancer research.